My friend/former co-worker Fiona sent me a link from one of the most poorly written web sites I've ever seen. Are you ready to be horrified? 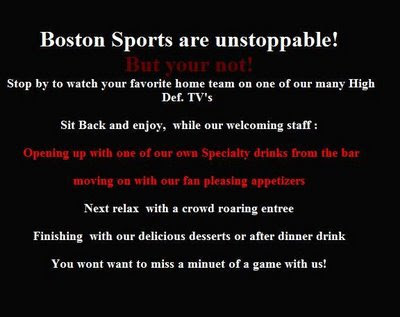 Two apostrophe catastrophes (three if you count "TV's" as a catastrophe -- depends on your style guide), random capitalization, subject verb disagreement, spacing problems, a spelling mistake, no periods, missing hyphens, run-on sentences ... this web site has it all. My brain hurts. So one of my students is now writing websites. . . Seriously though, I've seen worse than that! Me again. I spent but a few minutes at the restaurant's web site and my head exploded. fortunately I touch-type, so I don't need a head (or eyes) to comment. I'll include a link to the restaurant's site in a brief post today. It's awful. I wonder if the owner let his/her sixteen-year-old son or daughter author the site. Yikes! Carlos, did you really write to them to complain? That's hilarious. Let me know if they write back. I did...and I'll make sure I post the response...if I get one! The site is still bad but I couldn't find the minuet on the menu, but I'll bet they still serve it.